Dec E-mini S&Ps (ESZ16 -0.21%) are down -0.37% as prices consolidate following Friday’s rally to a record high. European stocks are down -0.77%, led by a sell-off in Italian bank stocks, as Italian Prime Minister Renzi faces a referendum next Sunday that may see voters reject his constitutional reform and force him to resign. The Financial Times reports that as many as 8 Italian banks risk failing if Renzi loses the vote on constitutional reform. Energy producing stocks are lower as well with Jan WTI crude oil (CLF17 +1.04%) down -0.67% at a 1-1/2 week low. Asian stocks settled mixed: Japan -0.13%, Hong Kong +0.47%, China +0.46%, Taiwan +0.69%, Australia -0.79%, Singapore +0.54%, South Korea +0.28%, India +0.13%. China’s Shanghai Composite rallied to a 10-1/2 month high after data showed profit at industrial companies in China rose for the eighth consecutive month. The dollar index (DXY00 -0.01%) is down -0.20% at a 1-week low. EUR/USD (^EURUSD) is up +0.20% at a 1-week high. USD/JPY (^USDJPY) is down -0.79%. Dec 10-year T-note prices (ZNZ16 +0.22%) are up +12.5 ticks. China Oct industrial profits rose +9.8% y/y, the eighth consecutive month that profits have increased. Key U.S. news today includes: (1) Nov Dallas Fed manufacturing activity (expected +3.0 to 1.5, Oct -1.5), (2) USDA weekly grain export inspections, (3) USDA Weekly Crop Progress. Russell 1000 earnings reports today include: Thor Industries (consensus $ 1.23). 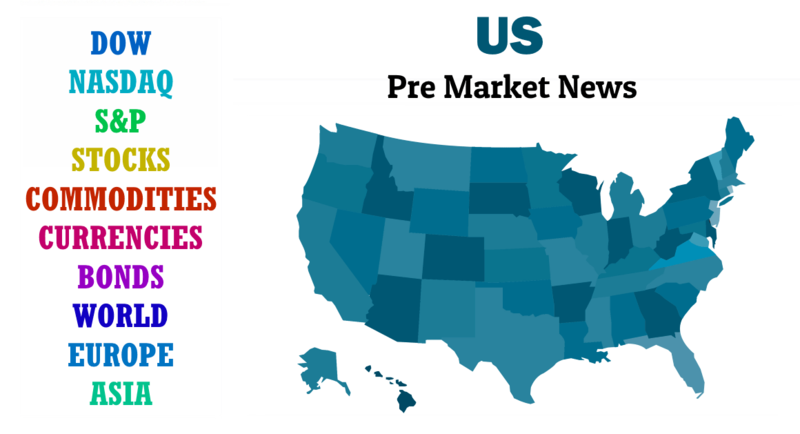 U.S. IPO’s scheduled to price today: Innovative Industrial Properties (IIPR). H&R Block (HRB +1.27%) was downgraded to ‘Sell’ from ‘Hold’ at BTIG LLC with a 12-month target price of $ 18. Hilton Worldwide Holdings (HLT +1.12%) and Marriott International (MAR +0.56%) were both downgraded to ‘Hold’ from ‘Buy’ at Evercore ISI. Citigroup (C +0.16%) was downgraded to ‘Hold’ from ‘Buy’ at Jeffries. Darden Restaurants (DRI +0.62%) was downgraded to ‘Hold’ from ‘Buy’ at Maxim. Finisar (FNSR -0.43%) was upgraded to ‘Strong Buy’ from ‘Buy’ at Needham & Co with a 12-month target price of $ 42. ConocoPhillips (COP -1.19%) was upgraded to ‘Buy’ from ‘Neutral’ at Goldman Sachs with a price target of $ 54. Fiat Chrysler Automobiles NV (FCAU +1.05%) was upgraded to ‘Buy’ from ‘Sell’ at Evercore ISI. Southwestern Energy (SWN -0.26%) was upgraded to ‘Outperform’ from ‘Market Perform’ at BMO Capital Markets. Stifel Financial (SF -0.16%) was downgraded to ‘Neutral’ from ‘Outperform’ at Macquarie Research with a 12-month target price of $ 51. Advanced Auto Parts (AAP -0.11%) was added to the Focus List at JPMorgan Chase. UDR Inc. (UDR +0.39%) was upgraded to ‘Buy’ from ‘Hold’ at Evercore ISI with a 12-month target price of $ 38. L Brands (LB -0.37%) was upgraded to ‘Neutral’ from ‘Underweight’ at Piper Jaffray with a 12-month target price of $ 67. Dec E-mini S&Ps (ESZ16 -0.21%) this morning are down -8.25 points (-0.37%). Friday’s closes: S&P 500 +0.39%, Dow Jones +0.36%, Nasdaq +0.33%. The S&P 500 on Friday climbed to a new record high and closed higher on continued asset allocation as money managers exit bond funds and put the money into stock funds on speculation President-elect Trump’s economic policies will boost growth and corporate profits. Dec 10-year T-notes (ZNZ16 +0.22%) this morning are up +12.5 ticks. Friday’s closes: TYZ6 -5.00, FVZ6 -1.25. Dec 10-year T-note futures on Friday sold off to a fresh 2-year nearest-futures low and closed lower on technical selling and the rally in the S&P 500 to a new all-time high, which reduces the safe-haven demand for T-notes. The dollar index (DXY00 -0.01%) this morning is down -0.200 (-0.20%) at a 1-week low. EUR/USD (^EURUSD) is up +0.0021 (+0.20%) at a 1-week high. USD/JPY (^USDJPY) is down -0.79%. Friday’s closes: Dollar index +0.660 (+0.65%), EUR/USD +0.0034 (+0.32%), USD/JPY -0.18 (-0.16%). The dollar index on Friday closed lower on the wider-than-expected U.S. Oct advance goods trade deficit and pre-weekend profit-taking in the dollar after the sharp run-up to a 13-2/3 year high on Thursday. Jan crude oil prices (CLF17 +1.04%) this morning are down -31 cents (-0.67%) and Jan gasoline (RBF17 +0.92%) is down -0.0067 (-0.49%). Friday’s closes: Jan crude -2.00 (-4.17%), Jan gasoline -0.0543 (-3.81%). Jan crude oil and gasoline on Friday closed sharply lower on skepticism that OPEC can come to an agreement on a production cut after Saudi Arabia said it will skip Monday’s meeting between OPEC and non-OPEC producers and on Saudi Arabia’s insistence that Iran cuts its crude output in order for any OPEC cut in production can take place, while Iran asserts that it should be allowed to increase its crude production. US 1030 ET Nov Dallas Fed manufacturing activity expected +3.0 to 1.5, Oct -1.5.